We'd love to discuss the details of your meeting or event! If you do not see a time that is convenient for you, please contact us to schedule a time that suits your schedule. We like to think we’re a little hidden gem, a gem that can be a little tricky to find at first. So please take note of the maps and directions below. You can always give us a ring at 403.452.7938. Our office is in the Ramsay Design Centre which is a low brick building on the East side of 11 Street SE. 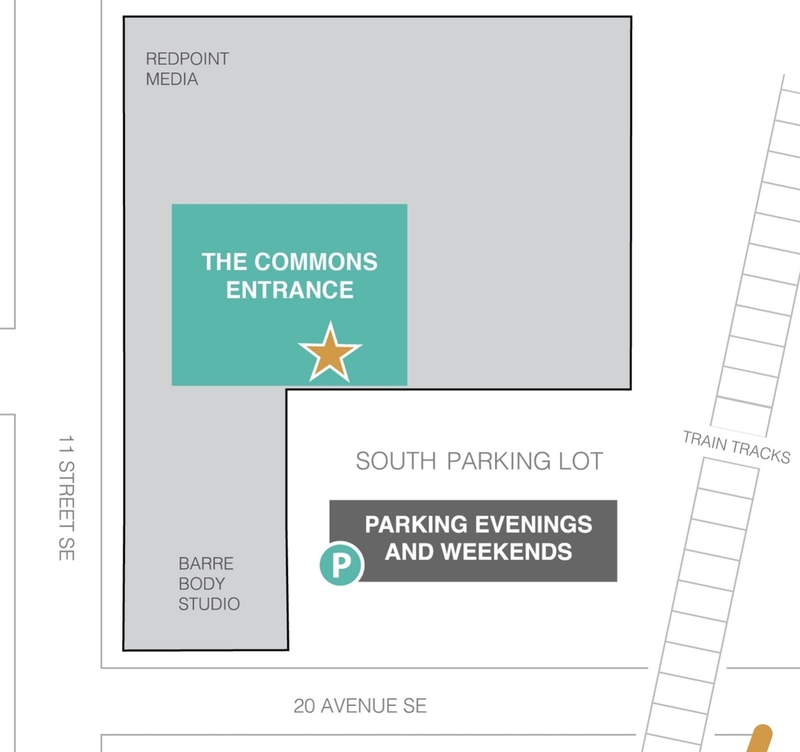 Enter through the south parking lot (you’ll see the Barre Body Studio signs near this entrance) and our door is directly ahead in the northwest corner, right beside the main entrance to the building. See our parking maps above. We are situated near many bike paths and the Elbow River. Store your bike in the office or at the bicycle-rack outside. There are approximately 5 bus stops within a 5 minute walking distance of The Commons. **Bus routes include the 302 and the 24, and Calgary Transit can help you plan your ride here. The Ramsay Design Centre is bustling with stylish enterprises and like any downtown office - is known to have its parking woes. But we’re here to the rescue! We have an abundance of hourly stalls for you to park your sweet ride located a short walk away (see above for maps). You can also find free parking in the community, only steps away from the office (psstt.. check out this map for street recommendations). We have free parking onsite in our North and South lots as well as paid parking in the Impark lot a short distance away. See above for downloadable maps.